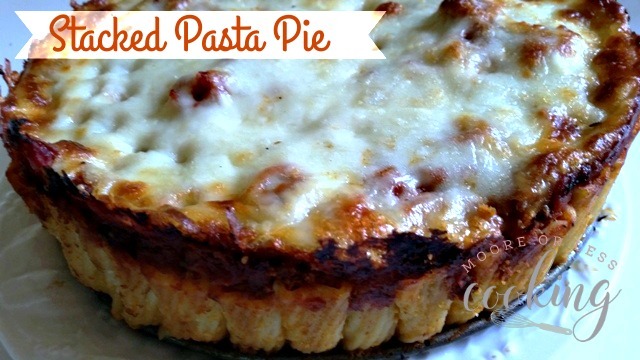 Wow your family and friends with this delicious and easy stacked pasta pie! Cheesy stacked pasta enrobed with a hearty meat sauce covered in more melty cheese. Serve like a slice of pie! I’m picky when it comes to what kind of sauce I serve with pasta. Having grown up in an Italian family, my grandmother made her famous red sauce, always simmering on the back of the stove. I looked forward to getting a chance to dipping a piece of bread in the sauce to see if it was thick enough to serve for dinner. I have been making her sauce for years. RAGÚ® Homestyle Thick and Hearty Meat Sauce is so flavorful and perfect just the way it is. Grandma would approve. It is a very thick sauce– you can tell by the way it hugs the pasta. You can taste the bold flavors in this sauce because Ragu peels, chops and simmers the ingredients and uses a special blend of herbs (basil, fennel, oregano and black pepper) to layer and build the flavor. Ragu doesn’t use artificial flavors, artificial colors or high fructose corn syrup. Cook the rigatoni until it is al dente ( firm to the bite). Try this trick, place a wooden spoon on the pot so the water doesn’t boil over. Giveaway! This beautiful set of wooden spoons! 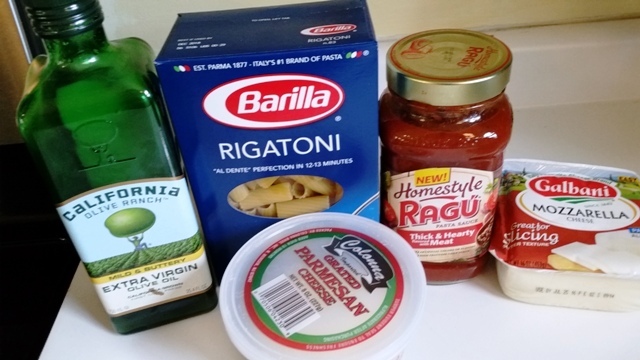 Just leave a comment below telling me what your favorite recipe is from the Ragu’s website. 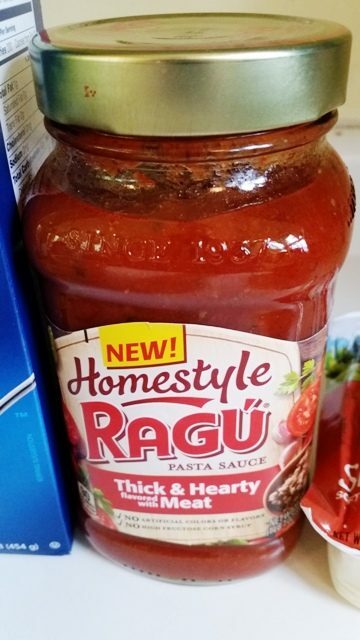 Visit Ragu and learn more about the new line of Ragu Homestyle sauces. Cheesy stacked pasta enrobed with a hearty meat sauce covered in more melty cheese. Serve like a slice of pie! Cover bottom of 9 inch springform pan with foil. Grease springform pan with butter. Set aside. Drizzle olive oil over pasta in a bowl. Mix with a spoon until pasta is coated. Sprinkle parmesan cheese over pasta. Mix with spoon until coated. Stack pasta in springform pan. Pour entire jar of Ragu Homestyle Thick & Hearty Meat Sauce over pasta. Use spatula to get in nooks and crannies. Use a chopstick if needed. Remove from oven sprinkle mozzarella cheese over pasta. Return to oven for another 10 minutes, or until bubbly and brown. Remove from oven , let set for 5 minutes. Slice in a pie shape. Serve! YUM! 1 winner only, valid in the USA. 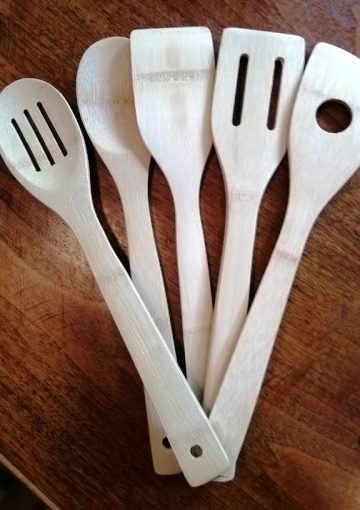 PRIZE: a set of wooden spoons. Contest is over~ winner is Patricia C.
The FARMER’S MARKET STACK Recipe on Ragu’s website looks delicious! What a great recipe! Looks delicious! My favorite recipe would be yours of course but the spicy veggie quesadillas look tasty too. That looks so delicious. I have always been a huge fan of pasta! I would love to try the Chicken Alfredo with Fettuccine! We love the spicy veggie quesadillas but we switch up the ingredients to each individuals tastes, thanks for an awesome giveaway ! This recipe looks delicious!! The CHICKEN & BROCCOLI ALFREDO WITH FETTUCCINE looks delicious too!! I think the recipe for the SPICY VEGGIE QUESADILLAS sounds so good! Shrimp Fra Diavolo LOOKS ABSOLUTELY WONDERFUL…CANT WAIT TO TRY IT! GRILLED CHICKEN PARMESAN – I never thought to make it with zucchinis! Yum! The CHICKEN & BROCCOLI ALFREDO WITH FETTUCCINE sounds really good! Oh my gosh the TUSCAN-STYLE SAUSAGE SANDWICHES sound amazing! 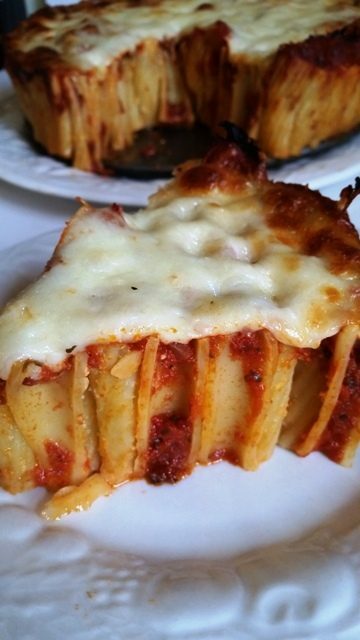 Oh my goodness that stacked pasta pie just amazing! Hmmm…I would go with the summer gazpacho, YUM! I want to try the turkey meatballs and spaghetti. I would love to make Grilled Chicken Paramesan! I think the Penne Primavera looks great! My favorite recipe would be the SUN-DRIED TOMATO & TONNO ORECCHIETTE recipe!! What a deliciously delightful idea! Comfort food, indeed! I’m such a huge fan of a delicious and hearty tomato sauce so I am all over this new line! The Shrimp Fra Diavolo looks divine…Also, pasta pie? Can you say HEAVEN!! Thanks for the chance! This Stacked Pasta Pie is fantastic, a great dish to serve for a crowd as well as family dinner. One of my favorite recipes from Ragu is the Caprese Faralle, a great summer dish. I cannot believe you made this with only 6 ingredients. I also know it is time consuming to put the noodles around the baking dish. I really like all the cheese on top. I like the recipe for SPAGHETTI PUTTANESCA! This looks great! So fun! And you make it look easy! Yummers! Thanks for the links to Ragu as well! I grew up with pasta and Ragu sauce. It’s got a special place in my heart, it does, and I LOVE what you’ve done with it! Bookmarked to try later!